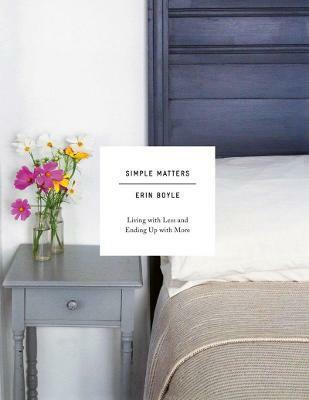 Erin Boyle shares practical guidance and personal insights on small-space living and conscious consumption. At once pragmatic and philosophical, Simple Matters is a nod to the growing consensus that living simply and purposefully is more sustainable not only for the environment, but for our own happiness and well-being, too. Boyle embraces the notion that "living small" is beneficial and accessible to us all-whether we're renting a tiny apartment or purchasing a three-story house. Filled with personal essays, projects, and helpful advice on how to be inventive and resourceful in a tight space, Simple Matters shows that living simply is about making do with less and ending up with more: more free time, more time with loved ones, more savings, and more things of beauty. Erin Boyle is the writer and photographer behind the popular blog Reading My Tea Leaves. She was formerly an editor at Gardenista. Past work in cultural preservation informs her desire to cherish what is beautiful, useful, and meaningful and to reevaluate everything else. She lives in New York City with her husband and daughter.